Cold Store UK is part of the long esablished RAC Kettering group of commercial and industrial refrigeration engineers and has its roots based in Kettering from the mid 1970's. The experienced and qualified engineers within the company have over 200 years combined knowledge of the the commercial and industrail refrigeration uk sector. We are able to give a nationwide service and have a blue chip customer base of some of the UK's largest companies. We operate anywhere in England, Scotland, and Wales . 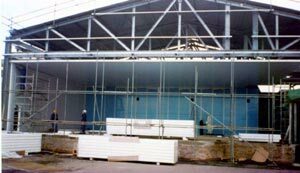 Refrigeration and Air Conditioning Kettering (RAC Kettering) can offer a full on site survey, design and build quotation for the supply and installation of the commerical or industrial refrigeration plant and equipment for walk-in coldrooms and bespoke larger cold store facilites. The design will include the coldroom doors whether hinged, sliding manual or automatic and your fire escape requirements. Low energy lighting including emergency lighting, and specialist flooring. We can also supply the racking or shelving to your requirements including meat hanging rails and sliding tracks. PVC strip curtains can be installed to reduce air movement when the doors are open and can give a considerable energy saving. The plastic strips can be selected for chill or freezer temperatures and for fork lift traffic or personnel and can be static or sliding track curtains. The service department can offer 24 hour call out service to clients and deal with the maintenance of the cold room doors including the Fermod automated sliding cold rooms doors, replacement of damaged gaskets and the door furniture. Repairs to the insulated walls caused by fork lift damage and fitting crash barriers or cladding of existing food production areas. Cold Store UK is operated by Icecape Ltd trading as RacKettering, who are long established commercial refrigeration engineers.